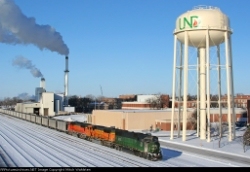 Welcome to Mitch Wahlsten's Railroad Picture Archives! Welcome to the RRPictureArchives.NET contributor site of Mitch Wahlsten. Hello...thanks for stopping on by to look at my collection of photos! When I am not spending time in my hometown of Brainerd, Minnesota, I am a student at the University of North Dakota in Grand Forks. As a result, most of the railroad-related photos I've taken come from either the BNSF Brainerd and Staples Subdivisions near Brainerd or the many different BNSF subdivisions near Grand Forks and Fargo, ND/Moorhead, MN. I do occasionally travel outside the vicinities of Brainerd, Grand Forks, and Fargo/Moorhead, however, and any photos I have taken outside of these areas are placed into their own specific folder(s) or lumped together in a "miscellaneous" folder.